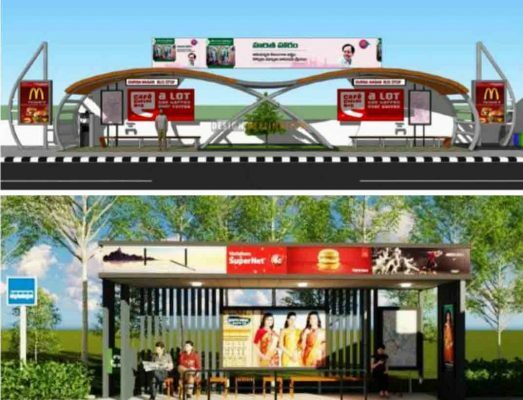 An artist’s impression of the proposed bus shelter which will be built in Warangal. Warangal Urban: A total of 162 smart bus shelters under the Smart City Mission would be set up under the Greater Warangal Municipal Corporation (GWMC) limits soon. The officials of the GMWC have already begun the exercise to this effect by issuing a Request for Proposals (RFP) from interested persons for construction, operation, and maintenance of the bus shelters with high quality amenities in select locations on Design, Build, Finance, Operate and Transfer (DBFOT) under four packages on Tuesday. While a pre-bid meeting is scheduled for February 18 to receive queries, bid submission date is Feb 23. Speaking to Telangana Today, GWMC commissioner N Ravi Kiran said the proposed bus shelters would be built on the lines of the bus shelters that have come up in Hyderabad. “They will have digital screens about routes, bus numbers, timings and announcement of the buses with air-conditioning facility. They will also have toilets at some select bus stations,” the official said. Meanwhile, the officials of the Town Planning department are busy in identifying the sites for the construction of the modern bus shelters. It may be recalled here a Smart Road from Fathimangar, Kazipet to Mulu X roads is being constructed under the Smart City Mission and a Command Control System on the lines of the one existing at Ahmedabad is also being constructed. Meanwhile, TSRTC officials are also gearing to issue the RFP for the reconstruction of the Hanamkonda bus station as Rs 80 crore that was earmarked from the Smart City Mission. District collector Prashanth Jeevan Patil visited the existing bus station a couple of days ago and asked the officials to take steps for the preparation of the detailed project report (DPR) at the earliest. The proposed bus station at Hanamkonda would have shopping area, movie screens and hotels in the upper portion of the bus station complex and there are should be at least 60 platforms. This ultra-modern bus station will come up in five acres of the land.